As a bride, I have this constant feeling of gratitude. People are always going out of their way to help Dave and me, and to make us feel special during this time in our lives. Whether someone gives you a gift or gave you their precious time, I think it is important to always write a thank you note. Writing a thank you note is such an easy way to show someone that you value them. That you value their time, their contribution or the gift they gave you. It is a small gesture that makes a big impact. I have written lots and lots of thank you notes in my personal life and for work. Here are some of the things that I think are the most important to remember when you are writing your own thank yous. When in doubt, write a note. There are some times that I'm really not sure if a thank you note is warranted. You probably know them. In most situations, I just write them. Personally I feel that writing someone a nice note can't do any harm. But always use your discretion. You don't want to be writing all sorts of notes whenever people hold the door for you. That would be weird. Thank you notes should always be written by hand. It is so easy to make the excuse "I can just call/text/email them," or "I'll thank them when I see them." While that is good, it doesn't take the place of a note. Especially in the case where someone has given you a gift (especially at a wedding or shower, where they might have spent a good sum of money!) you should make sure to write a thank you note. Keep supplies handy. That way you are always prepared! Dave and I didn't have an engagement party, but we did receive a few gifts when we got engaged. I always keep thank you notes and stamps on hand (I'm a bit of a hoarder), so I was able to send out thank you's right away! Don't wait. There is nothing worse than getting a card in the mail, opening it and having to rifle through those memories to remember what you are being thanked for. Don't be the person who sends out thank you notes months late. That's just rude. It will be fresh in people's minds, and will mean so much more if cards get to them quickly. Keep it short, make it nice, and make sure to personalize it. You don't have to go on and on for pages, a few sentences is fine. But for heavens sake, please make sure you are making it specific to the person you are writing to. Thank the person for what they actually did, or what they actually gave you. If Aunt Martha gave you a salad bowl for your bridal shower, mention how much use you are getting from that salad bowl! What's your opinion on writing thank you notes? Is it an outdated custom? 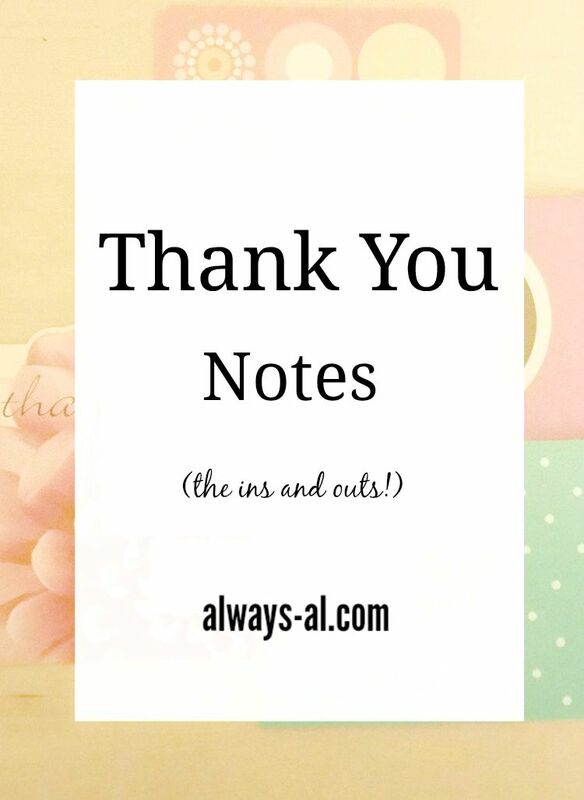 Do you have any other tips for writing a good thank you note?